On Saturday, Hong Kong will mark 20 years since the end of British colonial rule, when the Asian financial hub was handed back to mainland China. 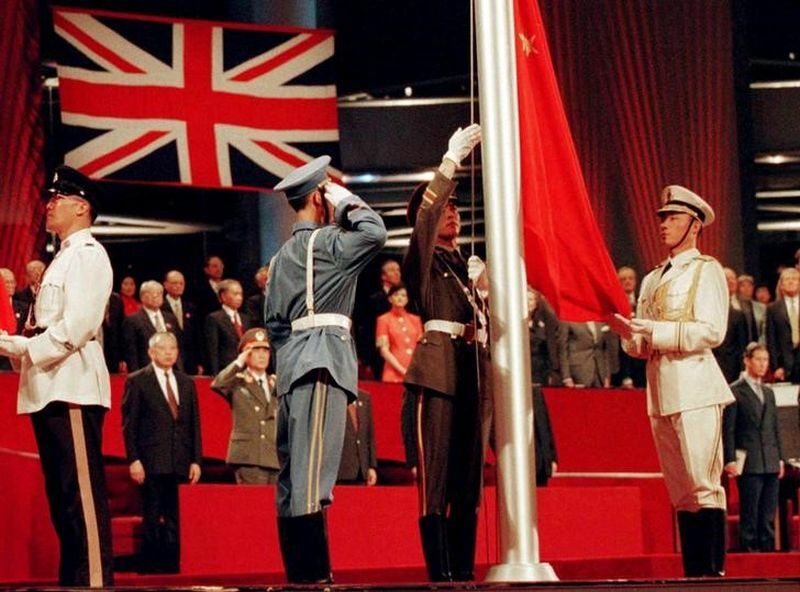 The Chinese flag is raised by People’s Liberation Army soldiers to signal Hong Kong’s return to Chinese sovereignty after 156 years of British rule, in Hong Kong, July 1, 1997. Negotiations over the future of Hong Kong took years before a treaty was signed in 1984 to return the territory at midnight on June 30, 1997. More than 4,000 PLA troops crossed the border into Hong Kong. Since then the garrison has tended to maintain a low profile in the city. Photo: Reuters/Dylan Martinez. A small investor watches share prices inside a bank in Hong Kong, December 1, 1998. The 1997-98 Asian financial crisis triggered a market sell-off that led some emerging economies to impose trading controls or buy assets to calm investors. Hong Kong surprised markets with a US$15 billion intervention in August 2008 to fend off speculative attacks. While Hong Kong would later have to defend its free market credentials, supporters say the intervention saved the city during the crisis. Photo: Reuters/Larry Chan. The territory has seen tumultuous times since July 1, 1997, with economic turmoil, outbreaks of disease and more recently, pro-democracy protests casting shadows over the city, its stunning harbor and the New Territories up to the border with the mainland. 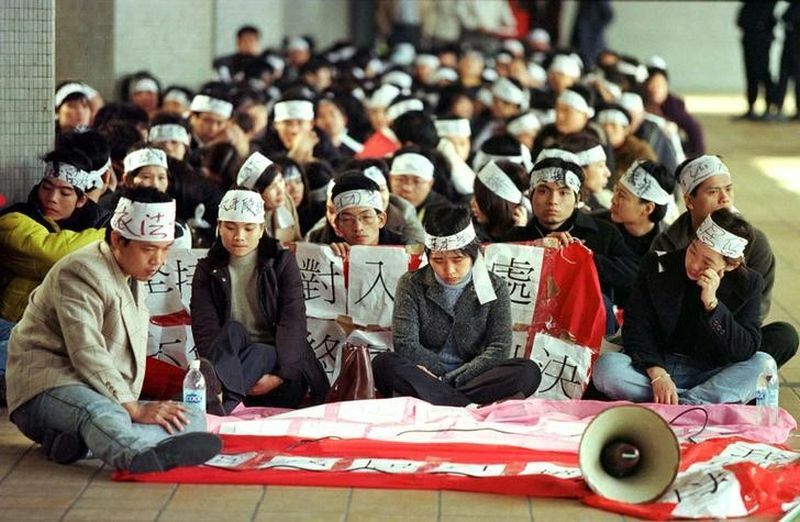 More than 100 mainland Chinese visitors wearing headbands protest outside Hong Kong’s Legal Aid Department to demand immediate residency in the territory, February 8, 1999. 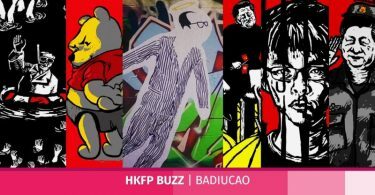 In 1999, the hopes of many aspiring cross-border families were dashed when Beijing, at the Hong Kong government’s request, overturned a ruling by Hong Kong’s top court that granted broad residency rights. “I will never forget this, nor forgive the government for what it did,” Ho Hei-wah, a veteran family activist, said later. “It split many families and meant they couldn’t live together.” Photo: Reuters/Bobby Yip. 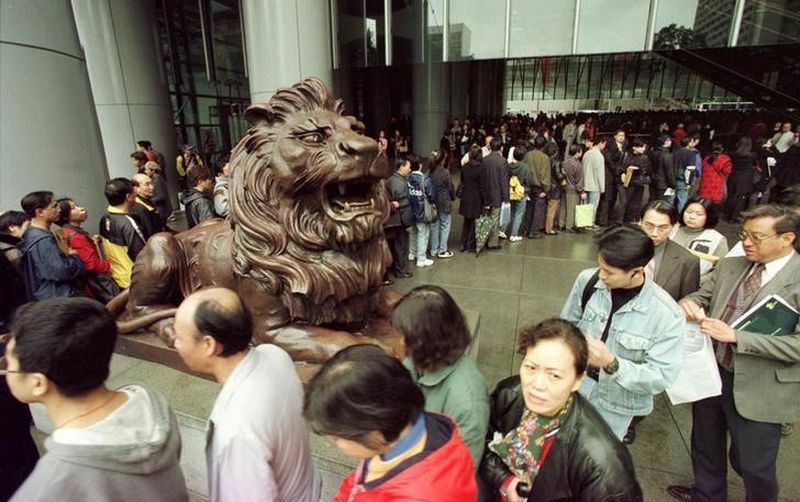 Investors queue up at HSBC bank in Hong Kong to apply to buy shares in tom.com, a new startup controlled by billionaire tycoon Li Ka-shing, February 23, 2000. Conceived during the dot.com craze as a pure Internet portal firm, tom.com raised nearly $100 million in a hugely oversubscribed initial public offering in early 2000 just as the Internet bubble was about to burst. The firm would go on an acquisition spree and later change its name to TOM Group. Photo: Reuters/Bobby Yip. Hong Kong’s reputation as a free-market haven was challenged during the 1997-98 Asian financial crisis, while the 2008 global financial crisis tested the health of its banks. 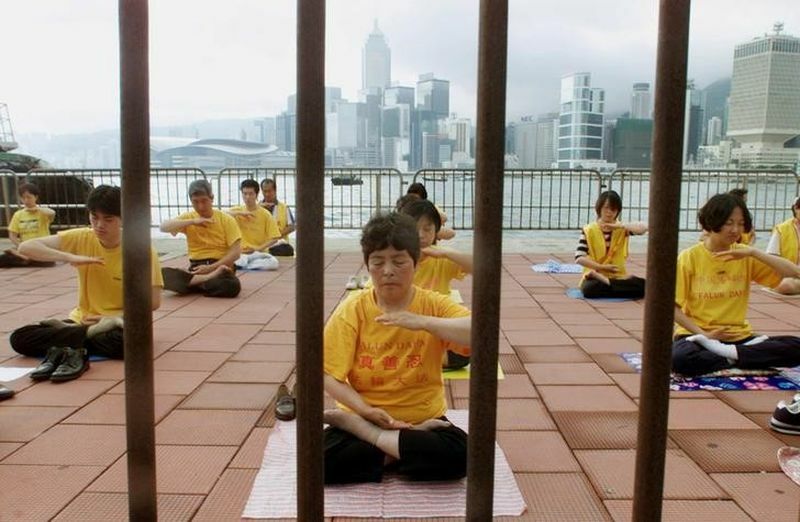 Falun Gong followers meditate in Hong Kong, May 9, 2001. 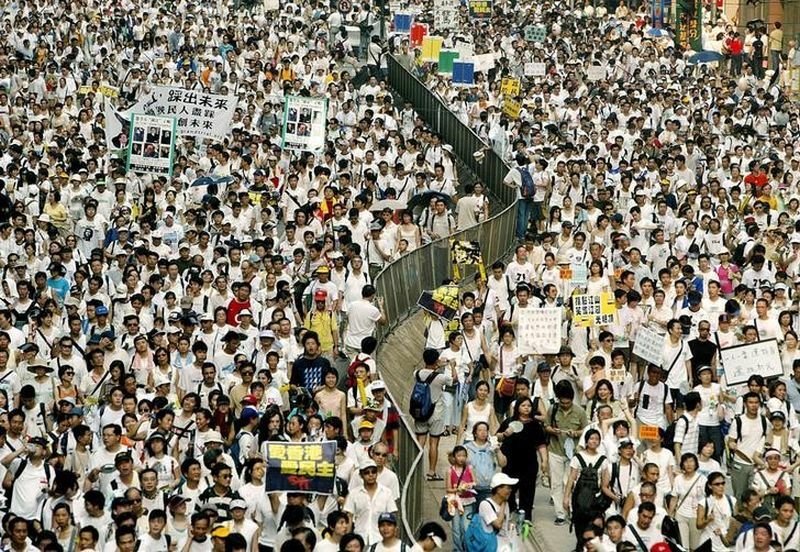 Members of the spiritual movement have over the years protested in Hong Kong after Beijing banned the group on the mainland in 1999, declaring it a “cult”. While largely tolerated in Hong Kong, 16 members were convicted in 2002 for protesting outside Beijing’s liaison office in the territory. Eight of those convictions were later overturned by Hong Kong’s highest court. Photo: Reuters/Kin Cheung. 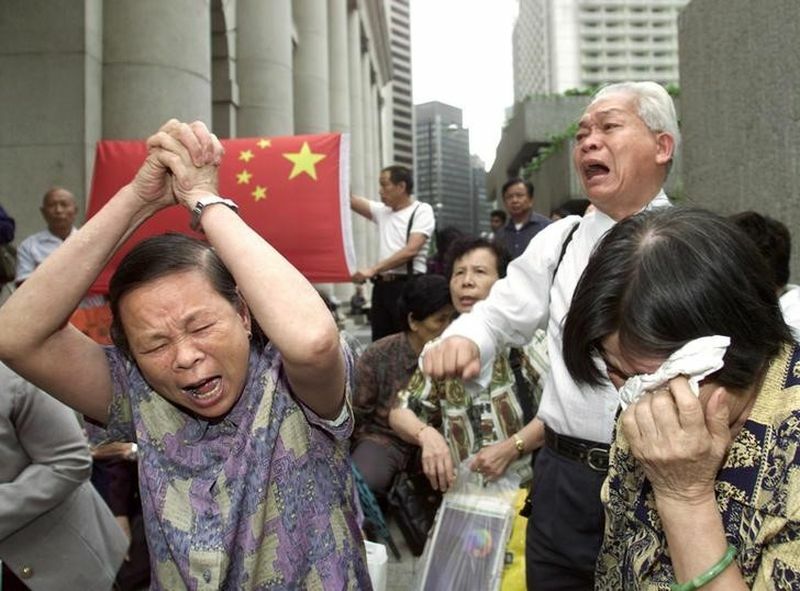 Hong Kong relatives of Chinese migrants cry after being expelled from a park in central Hong Kong, April 25, 2002. 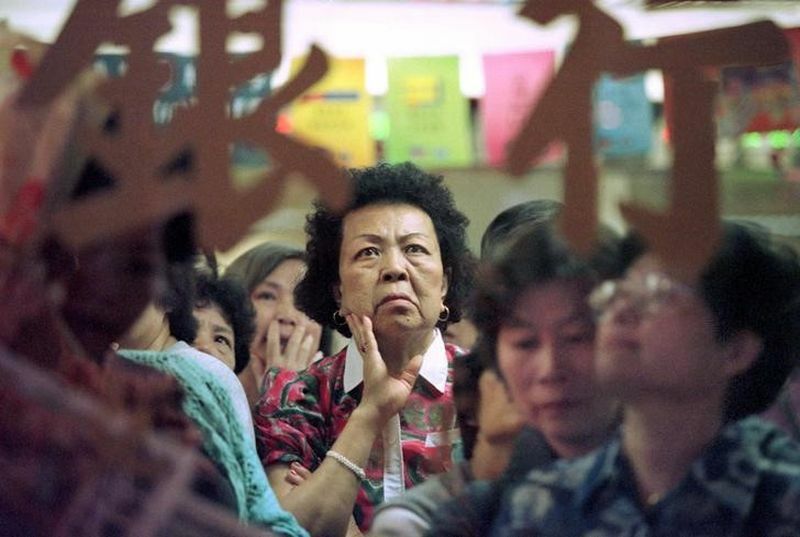 The residency issue flared up in 2002 when Hong Kong began deporting some 4,000 mainland Chinese who lost legal battles to stay in the territory. So-called “abode seekers” and their supporters staged protests, including surrounding the car of the island’s security chief Regina Ip. Photo: Reuters/Kin Cheung. The city of 7.3 million people suffered badly during an outbreak of severe acute respiratory syndrome, or SARS as it is known, in 2003, when 299 people died from the flu-like virus. A mourner wears a mask to ward off the SARS virus while attending the funeral of doctor Tse Yuen-man in Hong Kong, May 22, 2003. Hong Kong was the hardest hit by the flu-like SARS virus when the WHO declared a pandemic in March 2003. Some 299 people died before the territory was declared SARS free in June. 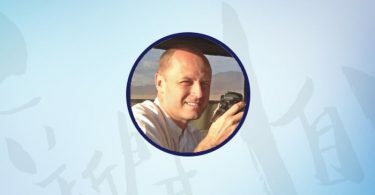 Among them was Tse, a 35-year-old doctor who had volunteered to care for SARS patients. She was given the highest honours at her funeral. Photo: Reuters/Bobby Yip. Demonstrators crowd a main street at a Hong Kong shopping district during a rally, July 1, 2004. Hundreds of thousands of protesters hit the streets on the 7th anniversary of the handover after China ruled out the possibility of universal suffrage in Hong Kong in 2007 and 2008, further slowing the pace of political reform. Beijing also ruled that it must approve changes to Hong Kong’s election laws, effectively vetoing any moves towards more democracy. Photo: Reuters/Bobby Yip. It was also among the places hardest hit by bird flu. 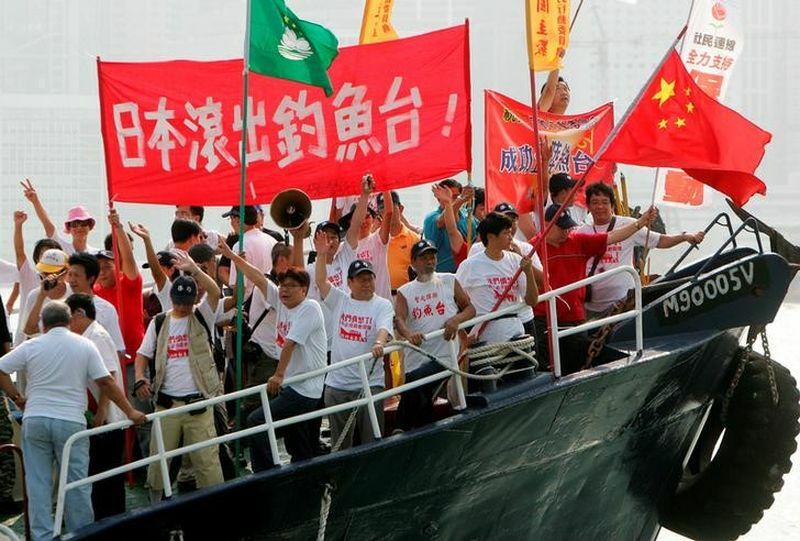 Activists shout slogans and wave the Chinese flag aboard a vessel in Hong Kong, October 22, 2006. Japan and China have sparred over a group of uninhabited islands known as the Senkaku Islands to Japanese and the Diaoyu Islands in China. The area is believed to lie near oil and gas reserves. In October 2006, a boat carrying activists from the Hong Kong-based Action Committee for Defending the Diaoyu Islands sailed within 20 km of the main island in the chain before they were warned off by a Japanese patrol boat. Chinese writing on a banner reads: “Japan get out of the Diaoyu Islands”. Photo: Reuters/Paul Yeung. Activists fight to save the Queen’s Pier in Hong Kong’s financial district, August 1, 2007. The colonial-era pier in the city’s financial heart became a civic battleground in 2007. The government wanted it removed for reclamation and roadworks, angering activists fighting to save what they viewed as a historic site. The saga reached boiling point in August when police forcibly evicted a band of activists and hunger strikers who had camped there for months. It was demolished in 2008. Photo: Reuters/Paul Yeung. A rush of money from mainland China vaulted Hong Kong into the ranks of the world’s most expensive property markets. It also fueled public anger over high living costs and a widening wealth gap. 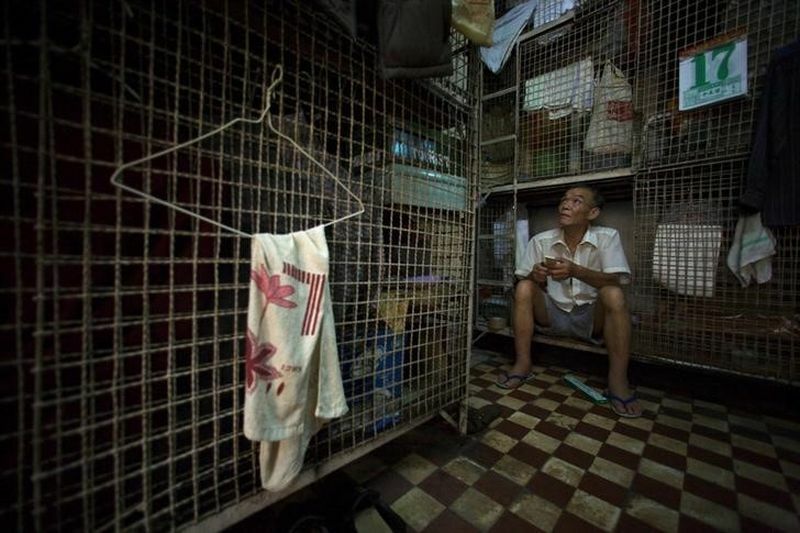 Kong Siu-kau waits for dinner in a small cage in Hong Kong’s Tai Kok Tsui district, July 16, 2008. As soaring property prices forced rents higher, thousands of Hong Kong residents moved into “cage homes”, 15-square-foot wire mesh cubicles usually crammed eight in a room. By 2017 an estimated 200,000 people were calling a wire cage or single bed in a subdivided apartment their home. Photo: Reuters/Victor Fraile. 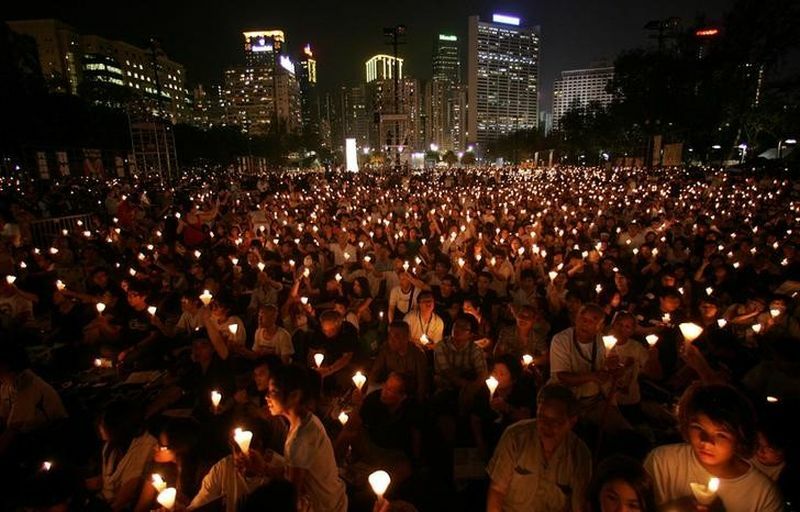 Activists hold a candlelight vigil at Hong Kong’s Victoria Park on June 4, 2009 to mark the 20th anniversary of the crackdown on the pro-democracy movement in Beijing’s Tiananmen Square in 1989. Cradling candles, laying wreaths and clad in black or white, Hong Kong residents transformed a downtown park into a speckled sea of flickering lights, in remembrance of the hundreds of pro-democracy demonstrators and students crushed by tanks and troops near the square two decades ago. Photo: Reuters/Aaron Tam. “My priority will be to heal the divide and to ease the frustration – and to unite our society to move forward,” Chief Executive-elect Carrie Lam said in March after her selection by a 1,200-person election committee stacked with Beijing loyalists. 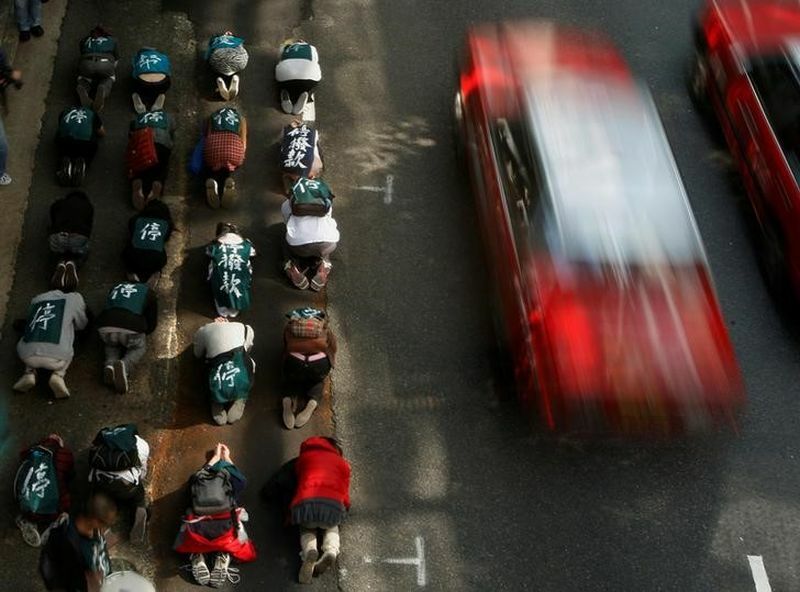 Protesters against a proposed high-speed railway to mainland China bow during a march to government headquarters in Hong Kong, January 16, 2010. The Hong Kong government’s proposed high-speed railway to the mainland became a lightning rod for broader discontent at the territory’s lack of democracy and government accountability for major policies. Public bitterness grew over the planned razing of a village and rural land to make way for the rail project, which has yet to be built. Photo: Reuters/Bobby Yip. 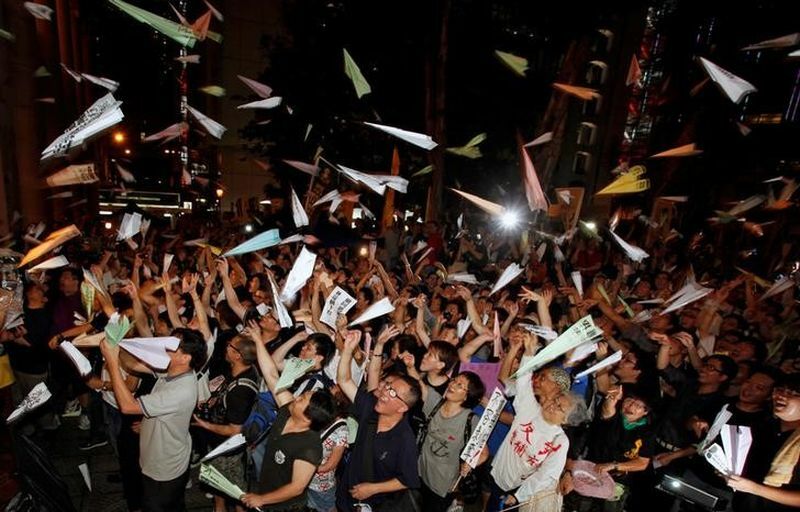 Hundreds of protesters throw paper planes outside the Legislative Council in Hong Kong, July 13, 2011. A contentious bill to scrap the mechanism for Legislative Council by-elections triggered several days of protests outside the council building. Hundreds of demonstrators threw paper planes with political messages at the building. Photo: Reuters/Bobby Yip. Chinese President Xi Jinping is due to attend anniversary events in coming days, including Lam’s swearing into office on Saturday as the city’s first female leader. 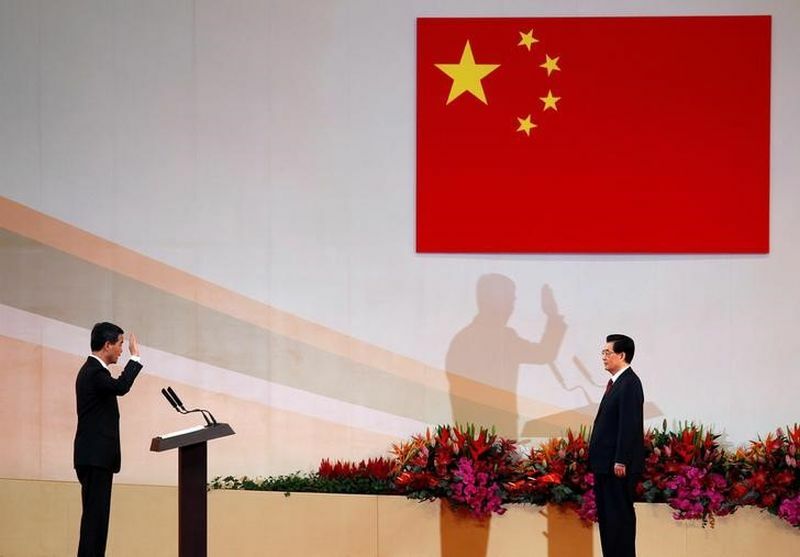 Hong Kong Chief Executive Leung Chun-ying (L) takes oath in front of Chinese President Hu Jintao during the inauguration of the new government in Hong Kong, July 1, 2012. When he took office in 2012, Chief Executive Leung Chun-ying pledged to make housing more affordable and to bring greater democracy to Hong Kong, issues that had stymied his predecessors. As he prepares to leave office, home prices continue to rise despite repeated cooling measures and political reforms have stalled. Photo: Reuters/Bobby Yip. 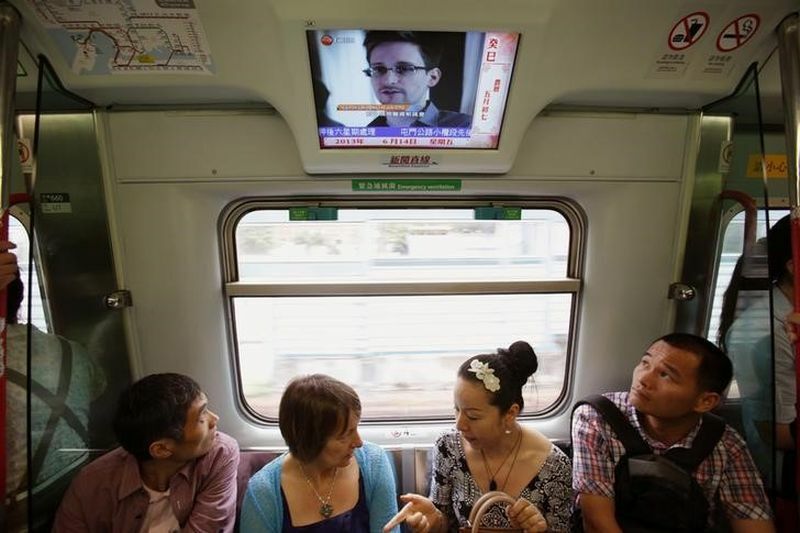 Passengers watch a television screen broadcasting news about Edward Snowden on a train in Hong Kong, June 14, 2013. The former U.S. spy contractor Edward Snowden created an international furore when he revealed U.S. surveillance secrets to the media. Snowden was in Hong Kong when the first stories about the leaks were published. As Washington sought his extradition, Hong Kong allowed Snowden to leave in June for Moscow where he was given asylum. Supporters see him as a whistle-blower who boldly exposed government excess, but others consider him a traitor. Photo: Reuters/Bobby Yip. Lam, 60, is the territory’s fourth leader since it reverted to Chinese rule in 1997. 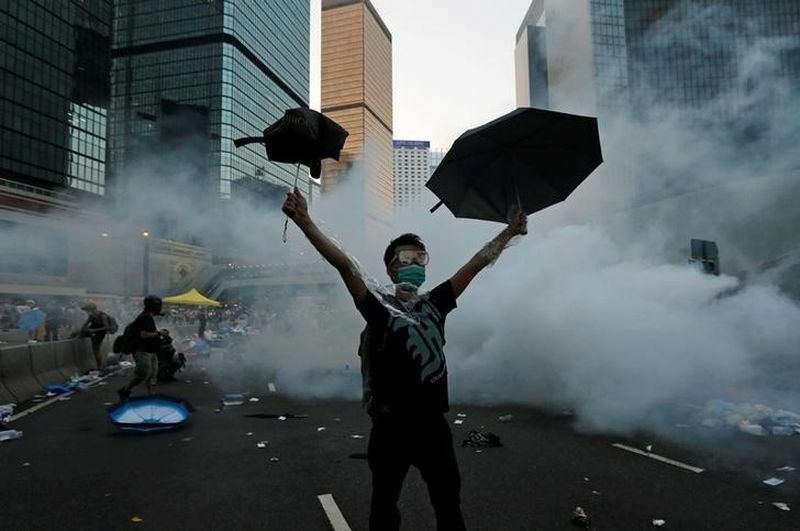 A protester raises his umbrellas after riot police fire tear gas to disperse protesters in Hong Kong, September 28, 2014. Large-scale protests calling for a fully democratic vote to choose Hong Kong’s next leader rocked the city for over two months in 2014. The so-called Occupy Central campaign was the most serious challenge to China’s authority since the 1989 pro-democracy demonstrations and crackdown in Beijing’s Tiananmen Square. 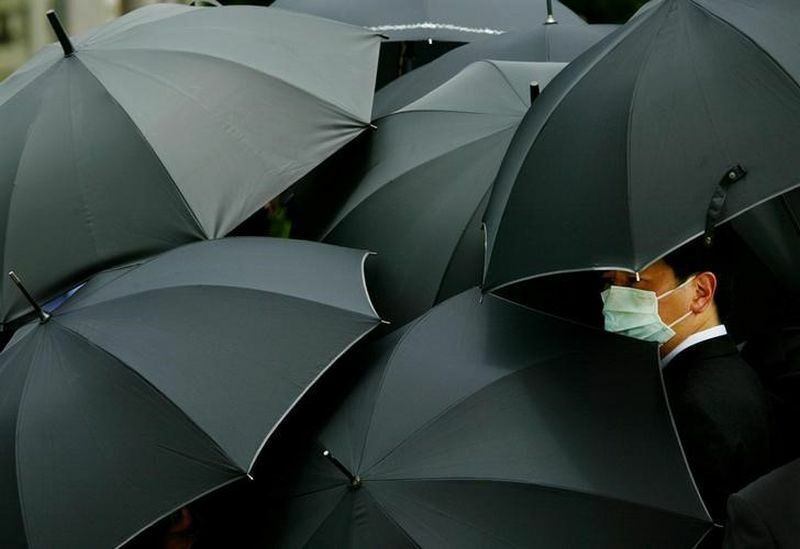 Umbrellas became a symbol of the 2014 campaign as protesters used them to fend off police pepper spray attacks. Photo: Reuters/Tyrone Siu. 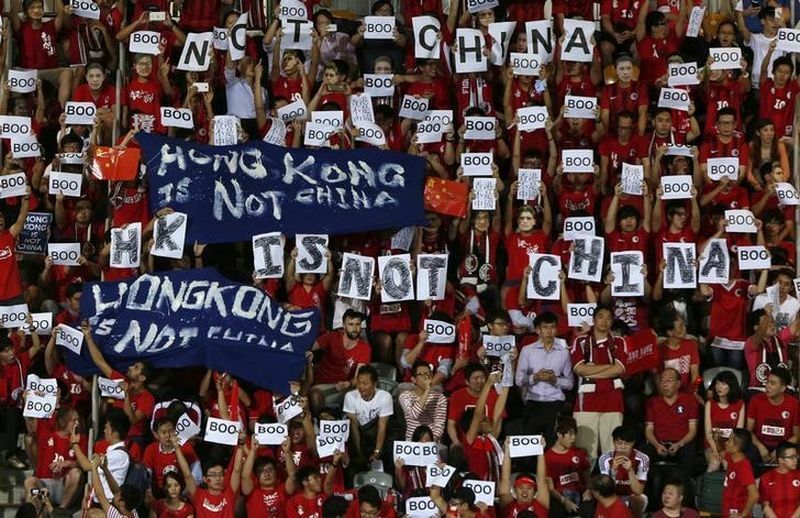 Hong Kong fans hold banners and character signs which read “Hong Kong is not China”, during the 2018 World Cup qualifying match between Hong Kong and China, in Hong Kong, November 17, 2015. 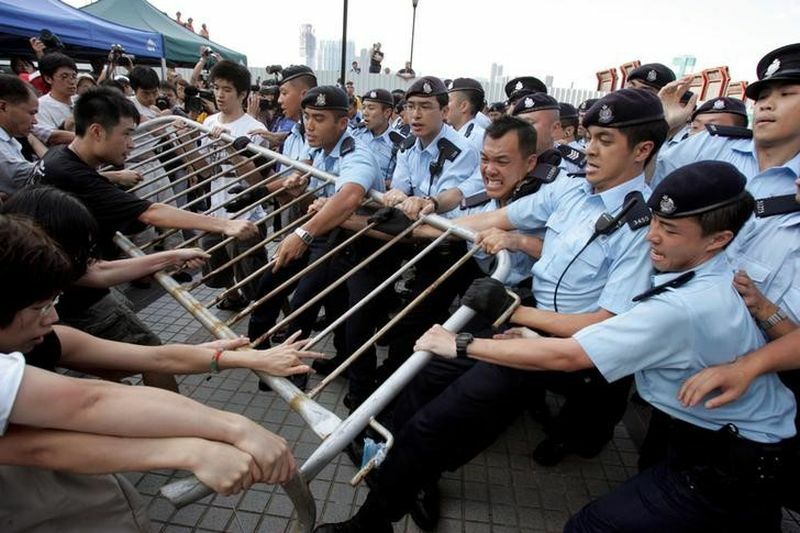 Less than a year after the Occupy protests, tensions were high going into match between Hong Kong and China. Fans booed the playing of the Chinese national anthem during the match, which ended in a 0-0 draw. Photo: Reuters/Bobby Yip. As part of the handover, a mini-constitution known as the Basic Law promised that Hong Kong would retain a high degree of autonomy under a “one country, two systems” formula, with full democracy an “ultimate aim”. An unidentified injured man is escorted by riot police at Mong Kok in Hong Kong, February 9, 2016. 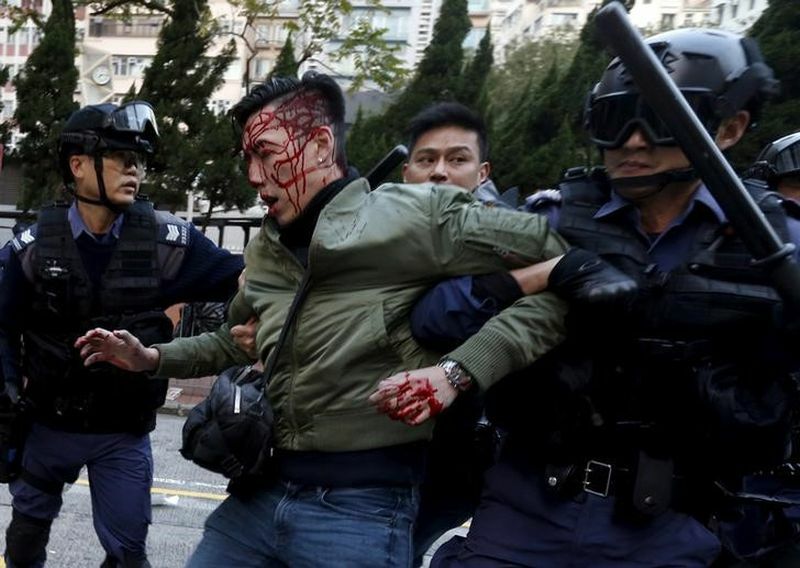 Riot police used batons and pepper spray early to quell fights after authorities tried to move illegal street vendors from a working-class Hong Kong district, the worst street clashes since pro-democracy protests in late 2014. Photo: Reuters/Bobby Yip. 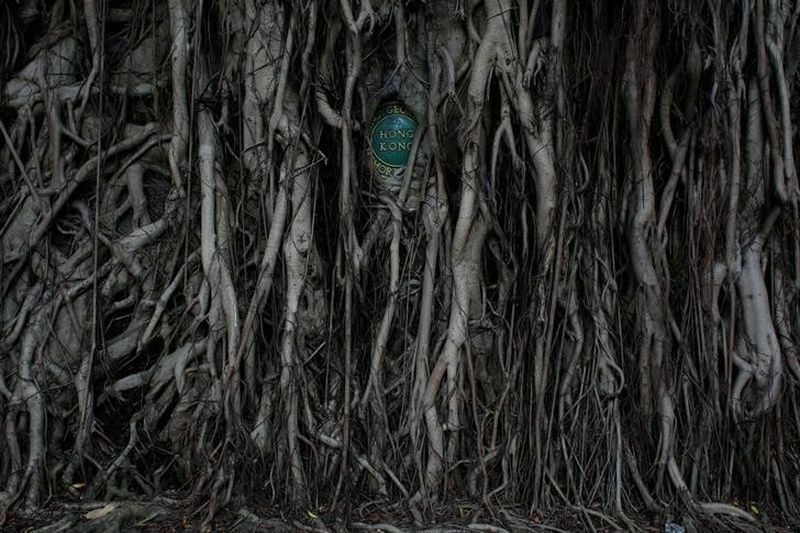 A plaque is partly hidden between the roots of a banyan tree at the King George V Memorial Park in Hong Kong, one of the few parks bearing former colonial links to the territory’s past, May 12, 2017. Photo: Reuters/Bobby Yip. But two decades later, there’s no sign of that aim. China declined to make any concessions to student protesters demanding universal suffrage in “Occupy” street demonstrations in 2014. Frustration among democracy activists has simmered ever since.